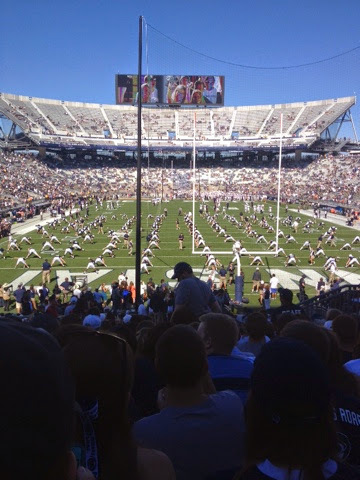 This weekend was the Penn State Homecoming game. It was a blast getting to see all the Alumni - even the ones from Alumni Blue Band. Penn State is such a tradition based school full of history that seeing and hearing the different perspectives of all the graduates makes me so happy. The group of friends I went with to the game wanted to get there super early to be in the S Zone. Basically, the Blue and White Society - the Alumni organization - buys shirts that form a S - the old symbol of Penn State before it became the lion. 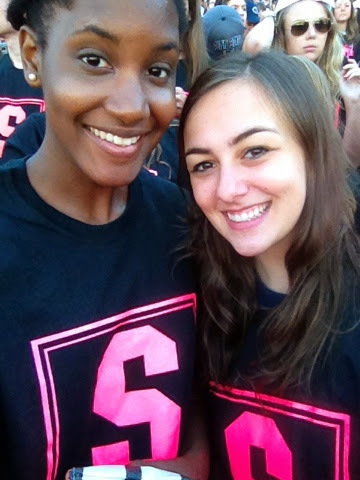 Homecoming is even more special because you get a shirt in the original colors of Penn State - pink and black. I have every S Zone shirt made except for the white with the blue lettering. I love that our school encourages school spirit so much that they spell out the S every game. Below is a picture of KW and I rocking our S Zone t-shirts. Being that it was homecoming, I always like to dress up a little and play with the Penn State colors. I wore these blue and white ikat shorts with a Penn State blue frat tank. 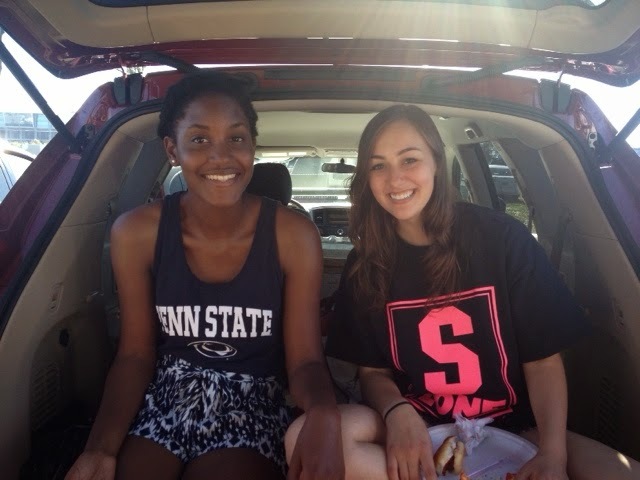 It was perfect for the 80 degree weather that day and for all the walking we did to get to our friend's parents' tailgate. KW and I chilled in the car while most people played the frisbee can game or just talked under the tent. Dan's mom also made queso which apparently was delicious.